Cellulose nanocrystals (CNCs) were prepared from kraft pulps of eucalyptus, birch, and softwood. The different kraft pulps were hydrolyzed using strong sulfuric acid in order to obtain colloidally stable CNCs. The CNCs were studied using flow cytometry (FCM). The light scattering properties of the CNCs in side direction and forward direction were documented. The use of a selective staining agent in combination with FCM analysis enabled detection of the hydrophobic particle populations within the CNC suspensions. The hydrophobic particles were seen clearly in the CNCs from the eucalyptus and birch kraft pulps, but not in the CNCs from softwood pulp. These particles were shown to be linked with the content of lipophilic extractives, especially sterols, present in the kraft pulps. From this fact, it was concluded that FCM analyses offer useful information about the properties of CNCs in suspension. It was also concluded that the content of lipophilic extractives in different raw materials should be determined and considered prior to CNC production. Pre-extraction steps might be needed in order to produce high-quality CNCs from various raw materials, even from kraft pulps. Cellulose nanocrystals (CNCs) have received a lot of attention in research due to their physical and chemical properties, renewability, sustainability, and usefulness in composite materials (Favier et al. 1995a, b; Ruiz et al. 2000; Habibi et al. 2010; Wang et al. 2012). CNCs are a strong contender for various future applications in composite materials, due to their low cost and abundancy. CNCs are produced by acid hydrolysis of the amorphous and para crystalline regions of cellulose fibers, while the crystalline regions are left intact as rod-like particles (Marchessault et al. 1961; Habibi et al. 2010). The crystallites of CNCs are, therefore, similar to the crystallites of the cellulose fiber raw materials. A wide array of different raw materials have been tested for CNC production and specific hydrolysis and separation protocols have been established for each of these (Beck-Candanedo et al. 2005; Habibi et al. 2010). The cellulose raw material is normally hydrolyzed by addition of strong acid, in combination with controlled reaction conditions, i.e. temperature, agitation, and time (Revol et al. 1994; Dong et al. 1998; Wang et al. 2014). The length of the cellulose crystals after hydrolysis depends on the leveling-off degree of polymerization (LODP) of the starting material. It has been reported that milder hydrolysis conditions will eventually reach the LODP of the starting material with lower losses of material, but that the reaction times need to be severely prolonged (Battista 1950; Håkansson and Ahlgren 2005). The LODP for bleached wood pulp has been reported as 140–200 units (Dong et al. 1998; Habibi et al. 2010). The surface charge of the CNCs will be very different depending on the choice of acid; sulfuric acid introduces sulfate half ester groups to the CNC, while e.g. hydrochloric acid does not (Araki et al. 1999; Beck-Candanedo et al. 2005). The introduction of the anionically charged groups on the surface of the CNCs will greatly increase its colloidal stability and even prevent sedimentation. It was reported that initial hydrolysis of the cellulose raw material by hydrochloric acid can be followed up by a separate sulfuric acid treatment to introduce sulfate half ester groups on the cellulose microcrystals (CMCs), and fine-tune the viscosity properties of the suspension (Araki et al. 1999). CNC particles and suspensions have previously been characterized with a wide array of analytical methods, such as transmission electron microscopy (TEM), atomic force microscopy (AFM), photon correlation spectroscopy (PCS), x-ray diffraction (XRD), conductometric titration, elemental analysis, viscosity measurements, sedimentation measurements (Marchessault et al. 1961; Dong et al. 1998; Beck-Candanedo et al. 2005; Håkansson and Ahlgren 2005; Hirai et al. 2009; Chen et al. 2015). However, additional analysis techniques may still provide useful information, relevant to the ever-growing CNC community. Flow cytometry (FCM) is a relatively new technique in the field of pulping and papermaking. The technique was adapted from medical science, where it is used mainly for the counting of cells (Shapiro 2003). FCM measures the light scattering intensity of particles in suspension in forward and side direction. Furthermore, FCM can be used to measure the fluorescence of particles at different wavelengths, which is very useful when combined with addition of selective dyes to the samples. In the field of pulping and papermaking, FCM has so far been used to analyze colloidal wood pitch, bacteria, coated broke, precipitated oxalate, various filler particles, and polyelectrolyte complexes (Vähäsalo et al. 2003; Lindberg et al. 2004; Vähäsalo and Holmbom 2005; Strand et al. 2013; Häärä et al. 2014; Strand et al. 2018). With FCM techniques, it is possible to analyze particles in suspension directly without complicated pre-treatments. The strengths of the FCM technique are short analysis times, as well as insight into the behavior and interactions of particle populations in aqueous suspensions. The aim of this study was to obtain new insights about CNCs in suspension by FCM analyses. Raw materials that are available in large quantities worldwide, i.e. different kraft pulps, were chosen for this CNC study. An additional aim was to determine if eucalyptus, birch, or softwood kraft pulp was most suited for continued CNC production. ECF-bleached, once-dried softwood kraft pulp was obtained from a Finnish pulp mill. The softwood kraft pulp was prepared from a mixture of Nordic pine and spruce. ECF-bleached, once-dried birch kraft pulp was obtained from a Finnish pulp mill. ECF-bleached, once-dried eucalyptus kraft pulp was obtained from a pulp mill in Uruguay. Concentrated, analytical reagent grade sulfuric acid was obtained from Fisher Scientific UK. The H2SO4 was diluted with distilled water to 64 wt % and was allowed to cool down prior to use. Nile red was obtained from Tamro (Vantaa, Finland). The nile red was directly dissolved in methanol to a concentration of 10 ppm. A commercially prepared and available cationic starch (Raisabond 15) was obtained from Chemigate, Finland as a pre-boiled slurry. Sodium carboxymethyl cellulose, Mw 250, degree of substitution 0.9, was obtained from Acros Organics. Polyelectrolyte complexes (PECs) were prepared from the cationic starch and CMCs at a polycation to polyanion ratio of 5.5:1 according to a previously published procedure (Strand et al. 2018). The lipophilic extractives from thermomechanical pulp from Norway spruce were extracted with hexane. Colloidal wood pitch emulsions were prepared from the hexane extracts according to a previously published procedure (Sundberg et al. 1996b). 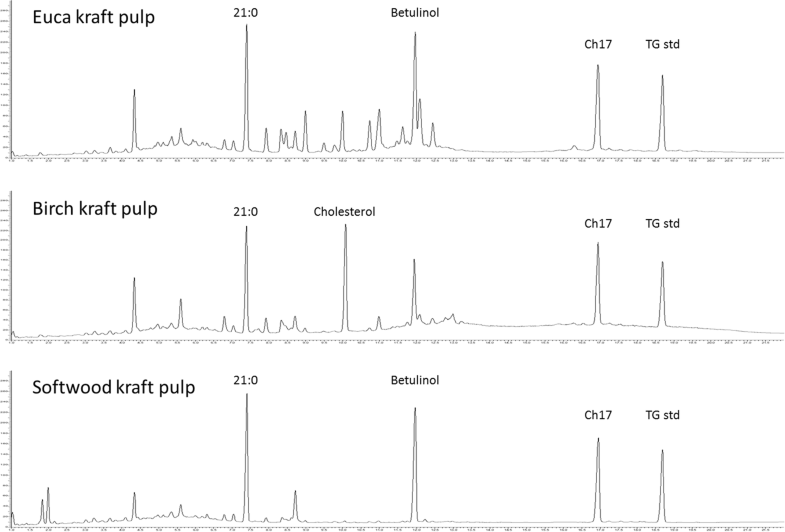 Analysis of carbohydrates in the dry kraft pulps was performed through methanolysis, silylation, and gas chromatographic analysis (GC) (Sundberg et al. 1996a). Resorcinol was added as internal standard for quantification. The analysis of sugar units was conducted with a long column GC (HP-1, 25 m × 0.20 mm) with split injection, equipped with a flame ionization detector (FID). The methodology gave information mainly about the amount of non-crystalline carbohydrates in the fiber samples. The determined sugar unit contents of the different kraft pulps are presented in Table 1. CNCs were prepared according to previously published methodology, with some modifications, and the concentration of acid during hydrolysis was chosen accordingly (Revol et al. 1994; Dong et al. 1998; Beck-Candanedo et al. 2005). Grinding of the different kraft pulps was performed with a laboratory-sized mill (IKA MF 10). The kraft pulp powders were freeze-dried for a few days. 5 o.d. g of the freeze-dried pulp was weighed into a glass bottle, and 250 mL of 64 wt % H2SO4 was added to the pulp. The pulp suspension was agitated by magnetic stirring for 30 min at room temperature in order to homogenize the mixture. The temperature of the suspension did not increase, since the pulp was completely dry when the H2SO4 was introduced. The glass bottle was sealed and placed in a 45 °C water bath for 25 min. The glass bottle was shaken manually continuously during this time, in order to further homogenize the mixture. The hydrolysis was stopped after 25 min by diluting the suspension 10 × with distilled water. Secondary aggregation of particles took place slowly in the diluted suspension. The suspension was allowed to sediment over night at room temperature. The diluted suspension was concentrated by centrifugation at 3400 g for 15 min. The supernatants were removed using a suction flask. The bottom phases were collected, diluted with distilled water, and again centrifuged at 3400 g for 30 min. The supernatants were again removed in order to concentrate the suspension. The collected cellulose fraction was diluted to 1 L with distilled water for washing. The suspension was again centrifuged at 3400 g for 30 min, and the supernatant was removed. The washing procedure was repeated one additional time. 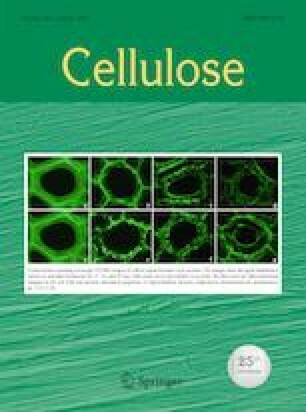 The collected cellulose fraction was dialyzed against distilled water for 4–5 days in a dialysis membrane with 12–14 kDa cut-off (Medicell International, UK). The dialysis water was replaced daily until the pH of the dialysis water remained unchanged over the course of 1 day. After dialysis, the CNC suspension was homogenized at 20,000 rpm using a Polytron PT3000 (GWB) for 5 min, and with ultrasonic impulses for 2 × 10 min. The CNC suspension was allowed to sediment, in order let large residual fiber fragments sink to the bottom of the flask. Only the non-sedimenting particles in the supernatant was used for further analyses. Flow cytometry (FCM) was used to analyze the CNC suspensions, using a Partec CyFlow Blue apparatus, equipped with a blue Argon laser (488 nm). The light scattered by the particles were recorded in forward direction (FSC) and side direction (SSC, 90°). The apparatus was also equipped with three different fluorescence channels, which recorded the scattering intensity in the green (512–542 nm), orange (575–605 nm), and red (615–645 nm) spectra. Filtered distilled water was used as sheath fluid in the analyses. Nile red (Tamro, Vantaa, Finland) was used as a fluorescent dye to stain the particles prior to FCM analysis, as in previously published studies (Vähäsalo et al. 2003; Vähäsalo and Holmbom 2005; Strand et al. 2013, 2018). Nile red is an environment-sensitive fluorophore that exhibits a blue-shift proportional to the hydrophobicity of its environment (Greenspan and Fowler 1985). It was expected that the added nile red mainly stained the surface of the CNCs, since the solubility of nile red in water is negligible. The CNC suspensions were diluted 4 × or 15 × with filtered distilled water prior to FCM analysis, depending on the concentration of detectable particles in the sample. 20 µL of methanol solution of nile red (10 ppm) was added to stain the CNCs, and the fluorescence intensity in the red spectrum was used as an indicator of particle hydrophobicity. FCM analysis was used to count the number of particles in the sample, and group the particles together as populations based on their recorded light scattering properties. Particle populations were gated using Partec FloMax software, in order to calculate the average scattering of particles in side and forward directions, as well as particle hydrophobicity (Vähäsalo et al. 2003). Grinding of the different kraft pulps was performed with a laboratory-sized mill (IKA MF 10). The kraft pulp powders were freeze-dried for a few days. Roughly 4 o.d. g of the different kraft pulp powders were packed into stainless steel extraction cells equipped with glass microfiber filters. Extractions were performed with a Dionex Corp. accelerated solvent extractor (ASE200) using a mixture of acetone:water:acetic acid (94:5:1 v/v). The samples were extracted consecutively three times for 5 min, at 100 °C and 13.8 MPa, and the extract from each extraction cycle was combined into one. The total volume of the extract was adjusted to exactly 50 mL at room temperature. The concentration of extractives was determined by gas chromatography using both long and short column techniques (Örså and Holmbom 1994). Exactly 10 mL of the extracts were pipetted into test tubes. Exactly 2 mL of internal standard, containing 0.02 mg/mL of heneicosanoic acid (21:0), betulinol or cholesterol, cholesteryl heptadecanoate (Ch17), and 1,3-dipalmitoyl-2-oleyl glycerol (triglyceride standard) in MTBE, was added to the samples. The samples were dried at 40 °C under a stream of nitrogen gas. The samples were dried to complete dryness in a vacuum oven (40 °C). The dry samples were silylated by addition of a 1:4:1 mixture of pyridine, N,O-bis(trimethylsilyl) trifluoroacetamide (BSTFA), and trimethylchlorosilane (TMCS). The silylation reaction took place in a 70 °C oven for 45 min. Analysis of different groups of extractives was conducted on a short column with a PerkinElmer Clarus 500 GC. The column was a HP-1, 7 m × 0.53 mm, with film thickness of 0.15 mm. Hydrogen was used as carrier gas (see e.g. Strand et al. 2011). The injection volume was 0.5 µL, on-column, and the detector used was a flame ionization detector (FID). Analysis of individual components was conducted on a long column with a PerkinElmer AutosystemXL GC. The used column was a HP-1, 25 m, 0.2 mm, with film thickness of 0.11 mm (see e.g. Strand et al. 2011). Hydrogen was used as carrier gas. The injection volume was 1 µL, split 24:1, and the detector used was an FID. Previously, the weight loss upon hydrolysis prior to level-off degree of polymerization (LODP) has been used to assess the amount of disordered material in pulps of different origins (Håkansson and Ahlgren 2005). Another method to determine the amount of disordered material in the starting pulps was applied in this study, i.e. acid methanolysis. It is known that the acid methanolysis procedure cannot hydrolyze crystalline cellulose, and it is commonly used to analyze the hemicelluloses and pectins in various ligno-cellulosic materials (Sundberg et al. 1996a). By performing acid methanolysis on these three kraft pulps, it was possible to get an approximation of the amount of amorphous and para-crystalline carbohydrate regions in the raw materials. The dominating sugar units detected in eucalyptus and birch kraft pulp were xylose and glucose (Table 1). The dominating sugar units detected in the softwood kraft pulp were glucose, xylose and mannose. A large part of the glucose was thought to originate from amorphous cellulose regions. By performing acid methanolysis on the kraft pulps, the content of easily hydrolysable carbohydrates was determined as roughly 25–29% by weight depending on raw material. The reaction conditions used in this study were not able to cleave all fiber residue into CNCs, and a significant fraction of partly hydrolyzed fiber fragments remained in the suspension. It has been reported that insufficient hydrolysis will result in larger particles with lower surface charge (Dong et al. 1998; Beck-Candanedo et al. 2005). This type of large particles have previously been described as partially hydrolyzed cellulosic residue (Chen et al. 2015). The CNC suspensions were allowed to sediment prior to flow cytometry (FCM) analyses, in order to circumvent the presence of large particles. Only the non-sedimenting particles in the supernatants were used as representative CNC samples for the different kraft pulps. 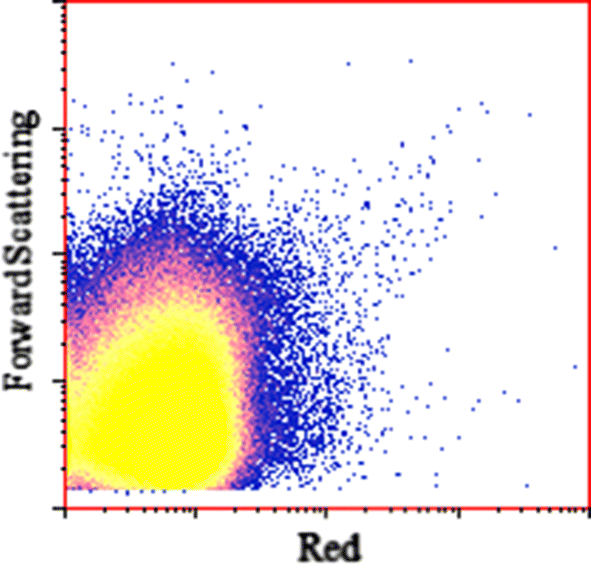 Flow cytometry of the CNCs prepared from the three different kraft pulps revealed clear particle populations (Fig. 1). The forward scattering (FSC) intensities of the CNCs were plotted against their side scattering (SSC) as logarithmic density plots. The graphs revealed single particle population for all of the three different CNCs as a function of their light-scattering ability. The shapes of the CNC populations were slightly different depending on the raw material used, which indicated that the choice of raw material influenced the resulting CNCs. Previously, FCM measurements of polyelectrolyte complexes (PECs) highlighted that the FSC and SSC offers quite different information about particles in suspension (Strand et al. 2018). It was theorized that the SSC gives information about the amount of dense and light scattering surfaces in a particle, while the FSC offers information about the transparency of a particle, as well as the complexity of its external or internal texture. However, both the SSC and FSC are connected to particle size. Information about the structural density of particles in suspension can be obtained by comparing the size estimation from FSC and SSC (Strand et al. 2018). The SSC of particles, in combination with calibration curves, has previously been shown to satisfactory estimate the particle size of a wide array of particles in suspension (Vähäsalo et al. 2003). The average values of the different particle populations were calculated and documented into Table 2. The determined average SSC of the different CNCs showed that birch kraft pulp resulted in slightly larger particles than eucalyptus kraft pulp, and significantly larger particles than the softwood kraft pulp. It is known that different raw materials will result in CNCs of different dimensions, depending on the LODP of the cellulose raw material (Marchessault et al. 1961; Håkansson and Ahlgren 2005). It has previously been reported that treatment of black spruce kraft pulp with 65% H2SO4 gave CNCs with a length of 100–200 nm, and a width of about 5 nm (Revol et al. 1992, 1994). The measured side scattering of the particles by FCM are in the same size range as previously reported values of the lengths of CNCs made from cotton fibers (Dong et al. 1998). It has been reported that the length of CNCs from black spruce sulfite pulp and eucalyptus pulp were 147 nm and 141 nm respectively after treatment with 64% H2SO4 at 45 °C for 25 min (Beck-Candanedo et al. 2005). The average length of CNCs produced from eucalyptus kraft pulp has been reported as between 130 and 281 nm, depending on the conditions during hydrolysis with H2SO4 (Chen et al. 2015). It was reported that the length of CNCs produced from microcrystalline cellulose originating from Norway spruce was 200–400 nm, with a width of less than 10 nm (Bondeson et al. 2006). In the current study, the determined SSC values of the different CNCs ranged between 170 and 270 nm. This indicated that the size-estimation from SSC actually represented the length of the CNCs, while the width was far below the detection limit of the FCM apparatus. 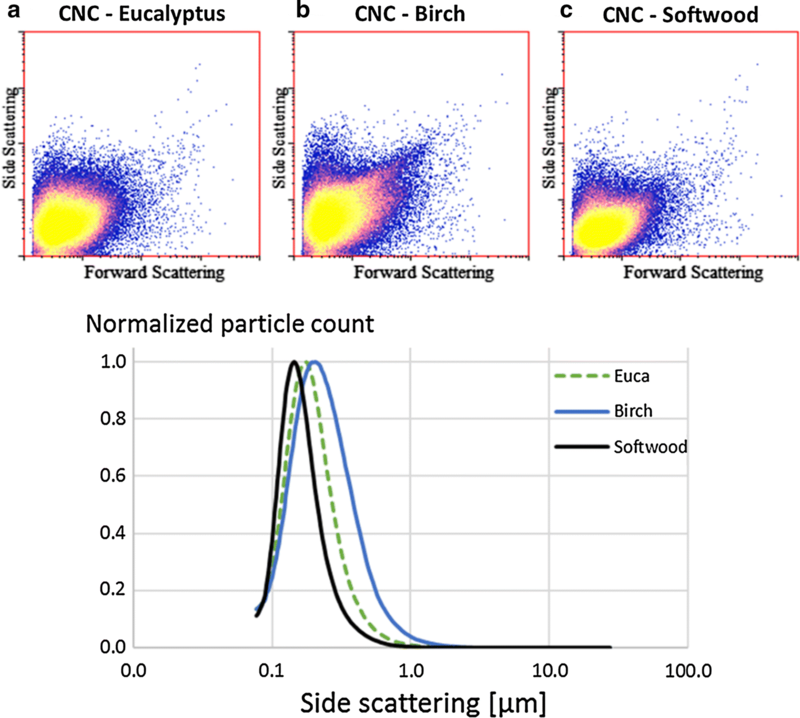 From the normalized side scattering-curves it was also seen that the size of the CNCs from the birch and eucalyptus kraft pulps resulted in slightly larger particles than the softwood CNCs. The hydrophobicity of the CNCs were measured by FCM analyses with the added hydrophobic staining agent nile red. A small volume of nile red dissolved in methanol was added to the CNCs prior to injection into the FCM apparatus. Nile red is an environment-sensitive fluorophore that exhibits a blue-shift proportional to the hydrophobicity of its environment (Greenspan and Fowler 1985). The fluorescence intensity from nile red in the red spectrum has previously been used to investigate the hydrophobicity of various particles in combination with FCM analysis (Vähäsalo et al. 2003; Vähäsalo and Holmbom 2005; Strand et al. 2013, Strand et al. 2018). The nile red is believed to mainly adsorb onto the surfaces of the particles, since its solubility in water is negligible and migration into the CNCs is unlikely (Greenspan and Fowler 1985; Jose and Burgess 2006). The FSC intensities of the CNCs were plotted against their fluorescence intensity in the red spectrum (red) as logarithmic density plots (Fig. 2). Plotting FSC versus particle hydrophobicity revealed that the CNCs in fact consisted of two different particle populations, which was not detectable when only the light-scattering properties were plotted (Fig. 1). The FCM measurements showed a dominating particle population with low hydrophobicity, and a smaller population of particles with higher hydrophobicity in the eucalyptus CNCs and in the birch CNCs (Fig. 2). However, only traces of the hydrophobic population were seen in the CNCs from softwood. The fluorescent intensity in the red spectrum of the CNCs prepared from birch kraft pulp was compared with previously encountered particle populations in FCM. As an example of very hydrophilic particles, polyelectrolyte complexes (PECs) from a commercial cationic starch mixed with carboxymethyl cellulose was chosen (Fig. 3). It is known that these PECs are very hydrophilic particles, since they consist of hydrated polysaccharide chains locked in contact by the attraction of oppositely charged groups (Strand et al. 2018). Calculations showed that the average red fluorescence intensity of this PEC population was 0.35. As an example of very hydrophobic particles, colloidal wood pitch droplets in suspension was chosen (Fig. 3). It is known that these particles are hydrophobic, since they consist of lipophilic extractives dispersed in water. The colloidal wood pitch has been reported to consist of a core of triglycerides and steryl esters, with an outer shell of surface active resin and fatty acids (Qin et al. 2003). Calculations showed that the average red fluorescence intensity of the colloidal wood pitch population was 8.33. 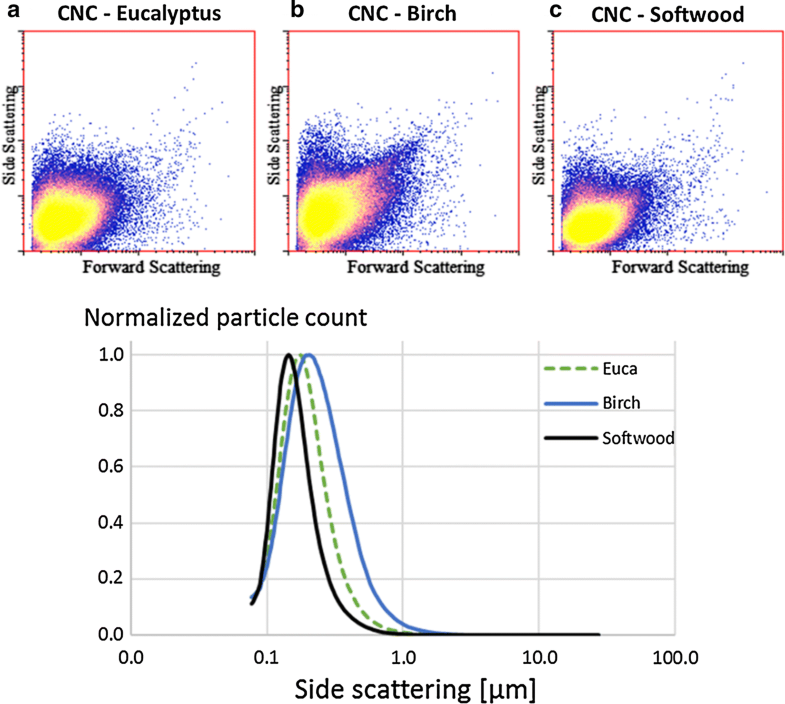 When reexamining the two particle populations in the CNCs from birch kraft pulp alongside the PEC population and the colloidal wood pitch population, it is clearly visible that there are traces of these two populations within the CNC sample (Fig. 3). 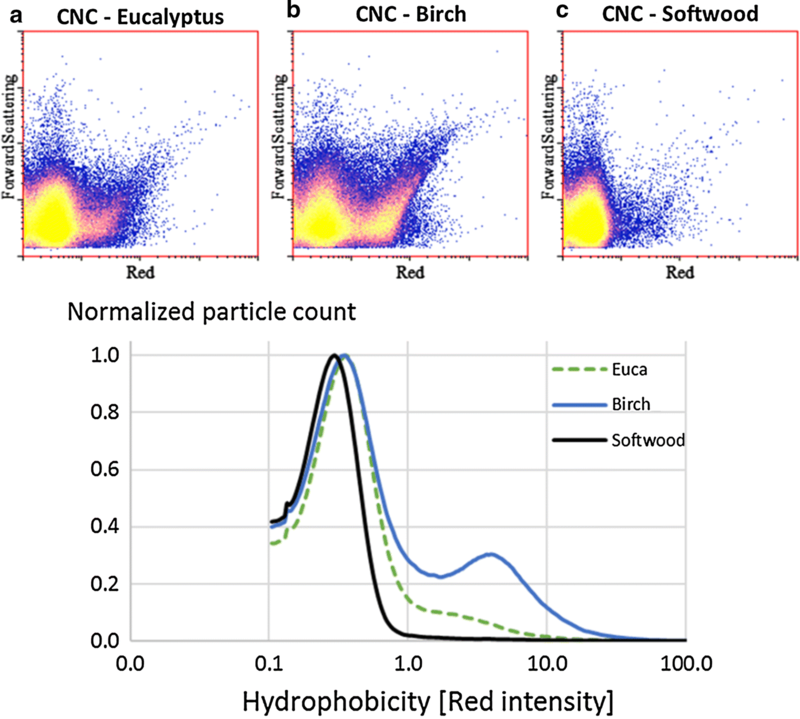 By gating the populations separately, it was possible to calculate the average red fluorescence intensity of the hydrophilic CNC population and the more hydrophobic population. The hydrophilic part of the birch kraft CNC had an average hydrophobicity value quite close to that of hydrated polysaccharide surfaces, i.e. 0.41. The hydrophobic part of the birch kraft CNC had an average hydrophobicity closer to the average hydrophobicity of colloidal wood pitch, i.e. 5.75. The hydrophilic part of the CNC was slightly more hydrophobic than clean hydrated polysaccharide surfaces of the polyelectrolyte complexes (Fig. 3a). The hydrophobic part of the CNC was less hydrophobic than colloidal wood pitch on its own (Fig. 3c). This indicated that the two populations were in fact a mixture of hydrophilic and hydrophobic components. The interactions between various hydrophilic filler particles and hydrophobic colloidal wood pitch has previously been studied in model systems by FCM analyses (Strand et al. 2013). It was shown that hydrophilic and hydrophobic populations in fact interacted with each other, and that they formed hybrid populations with intermediate hydrophobicity values. It was also shown that the interactions were slightly diminished by steric stabilization when water-soluble hemicelluloses (galactoglucomannans) were introduced as a third component to the system. In the current study, combining the two hydrophobicity values of the sub-populations resulted in an average value of 1.91 for the birch kraft CNCs. Because of these FCM analyses of the CNCs, it was theorized that the kraft pulps most likely contained lipophilic extractives that had survived the harsh acidic conditions of CNC production. Extraction of the three kraft pulps with an appropriate solvent was required in order to confirm this theory. The three kraft pulps were extracted with a mixture of acetone, water, and acetic acid. The content of lipophilic wood pitch components in extracts were analyzed according to standard laboratory procedure (Örså and Holmbom 1994). It was seen that all of the kraft pulps contained lipophilic components to some extent (Table 3). The three pulps did not contain noticeable amounts of triglycerides or steryl esters, since these components had been hydrolyzed into fatty acids and sterols by the strong alkaline conditions during the kraft cook (Back 2000). The dominating components in the eucalyptus and birch kraft pulp were fatty acids and sterols, as expected (Ekman and Holmbom 2000). It is known that the water-solubilities of long-chained fatty acids are very limited even at alkaline pH, and can be severely decreased at high conductivity values (Sundberg et al. 2009; MacNeil et al. 2011). This fact makes it very difficult to completely remove fatty acids by alkaline washing, even after kraft pulping. Traces of resin acids were also noticed in the hardwood pulps, which may have been added to aid deresination during washing at the pulp mills. The dominating components in the softwood kraft pulp were fatty acids and resin acids (Table 3). The detectable content of lipophilic extractives in the three kraft pulps were quite low overall, only from 48 to 188 µg/g o.d. pulp. Still, these amounts were significant enough to be detectable by FCM analyses of the final CNCs. It is known that lipophilic extractives are not degraded by acidic conditions, which has previously been seen in analyses of extractives throughout an acidic sulfite pulping line (Sithole et al. 2010a, b). This meant that the fatty acids, resin acids, and sterols observed in the kraft pulps were able to withstand the harsh acidic hydrolysis step of CNC production, and remained with the CNCs through the rest of the production steps. When reexamining the visible hydrophobic particle populations in Fig. 2, it was clear that the highest content of hydrophobic particles was seen in the CNCs made from birch kraft pulp. There were significantly less hydrophobic particles in the eucalyptus CNC, and only a very low amount in the softwood CNC. It was expected that the content of lipophilic particles in the kraft pulps would correlate directly with the observed hydrophobicity of the CNC. However, eucalyptus kraft pulp had the highest content of lipophilic components, while birch kraft pulp contained slightly less (Table 3). In order to understand this, the hydrophobicity of the different groups of extractives need to be taken into account. The pH of the CNC suspensions after dialysis was roughly 5.5. It is known that a fraction of the fatty acids may have been deprotonated, formed soaps, and have been dissolved into the aqueous phase even at this moderate pH (Ström 2000; Sundberg et al. 2009). However, the large and bulky carbon skeletons of sterols, and the lack of carboxylic acid groups, indicate that these are very hydrophobic compounds (Sjöström 1981; Ekman and Holmbom 2000; Nisula 2018). Sterols have also been shown to be quite troublesome in deresination of sulfite pulp, unlike resin and fatty acids (Sithole et al. 2010a). When taking the surface-active nature, and pH-dependent water-solubility of fatty acids into account, it is clear that fatty acids need to be considered significantly less hydrophobic than sterols, at least at pH values higher than 3. The sterols most likely influenced the particle hydrophobicity to a higher extent than fatty acids. A more satisfactory correlation was found between the hydrophobic populations in the CNCs and the sterol content of the three different kraft pulps. The least hydrophobic particles were produced from the raw material that contained the lowest amount of lipophilic components, i.e. the softwood kraft pulp. Some of the birch kraft pulp was ASE-extracted with acetone:water:acetic acid (94:5:1 v/v) prior to CNC production. After pre-extraction of the birch kraft pulp, no separate hydrophobic population was seen in the CNCs, which indicated that the hydrophobic particles most likely originated from lipophilic extractives in the starting material (Fig. 4). These results indicate that the extractives content of different raw materials for CNC production needs to be determined and taken into account. Even low quantities of lipophilic extractives will alter the properties of CNC surfaces significantly, and lead to misinterpretation of data. The raw material containing the lowest amount of lipophilic components, especially sterols, is recommended for CNC production, unless a pre-extraction of is performed to remove these components. Cellulose nanocrystals (CNCs) were prepared from kraft pulps of eucalyptus, birch, and softwood. The different kraft pulps were hydrolyzed using strong sulfuric acid in order to obtain colloidally stable CNCs. The CNCs were studied using flow cytometry (FCM). The light scattering properties of the CNCs in side direction and forward direction were documented, as well as the hydrophobicity of the CNCs. Polysaccharide surfaces, such as cellulose, are known to be very hydrophilic in aqueous media. However, the presence of hydrophobic particles were seen clearly in the CNCs from the eucalyptus and birch kraft pulps; i.e. the CNCs consisted of a hydrophilic and a hydrophobic particle population. It was shown that the hydrophilic particles in the CNCs had a similar hydrophobicity value as polyelectrolyte complexes consisting of pure hydrated polysaccharide chains. It was also shown that the hydrophobic particles in the CNC had a similar hydrophobicity value as colloidal wood pitch droplets. It was determined that the increased hydrophobicity of the CNCs was an effect of lipophilic extractives, especially sterols, present in the kraft pulps. These lipophilic components were able to withstand the harsh acidic hydrolysis step of CNC production, and remained with the CNCs through the rest of the production steps. The use of a selective staining agent in combination with FCM analysis enabled detection of the hydrophobic particle populations within the CNC suspensions, even though the concentrations of lipophilic extractives in the raw materials were quite low. The difference in particle hydrophobicity was not detected from light scattering alone and would go completely undetected without the use of FCM. Furthermore, the FCM technique enables the user to gate certain particle populations and plot/calculate particle populations separate from each other. These facts indicate that FCM is a useful and powerful analysis technique also for CNCs. It should also be concluded that the content of lipophilic extractives in different raw materials need to be determined and taken into account prior to CNC production, if no pre-extraction step is employed. Open access funding provided by Abo Akademi University (ABO). This work is a part of the project ExtBioNet, appointed by the Academy of Finland, and part of the activities of the Process Chemistry Centre (PCC) at Åbo Akademi University, Turku, Finland. Special thanks to Ph.D. student Weihua Zhang and technology student Richard Sundberg at the Laboratory of Wood and paper Chemistry, Åbo Akademi University.